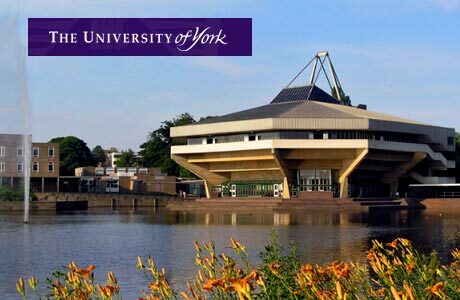 For applicants commencing MBBS study at the Hull York Medical School.For applicants commencing MBBS study at the Hull York Medical School.The University of York has been welcoming students from all over the world since it was established. International students form an integral part of the community on campus, and currently just over 20% of our students come from outside the UK. > York is consistently among the top UK universities for the quality of its teaching and research. > York is ranked in the top 100 universities in the world (THE/Thompson-Reuter World University Rankings and QS World University Rankings). > York was named Times Higher Education University of the Year 2010. We're pleased to award 90 scholarships to high-achieving international students. These prestigious scholarships will recognise academic excellence by offering a tuition fee discount. Applications will open on 14 January 2019. Five scholarships offering a tuition fee discount of £5,000 for each year of study (up to three years), for exceptionally high achieving students from any non-EU country. > have already met the English Language requirements of their offer (by 30 April 2019)Applicants cannot hold a 100% tuition fee scholarship or be fully sponsored.